Each station takes around 9:00. We did each station 2x, doing the fly set at the bottom after each station (4x total). “Buddy cords” refers to a stretch cord with a belt at both ends. Swimmer 1 pushes off and swims a 25 fly while swimmer 2 stays at the wall providing resistance for the 1st 10 cycles of fly. After the 10th cycle, swimmer 2 pushes off the wall and swims easy free following swimmer 1 who completes the 25 fly. For the Drag Sox, the Set utilizes the Sox worn in two different ways. Sox at the ankles provides high resistance to the kick. Moving them up to the calves provides a little less. Taking the Sox gives the swimmers the boost of a fully involved kick for the last 2×25. You can vary the number of press-outs and the interval to create many different interesting combinations of speed and reps. Make sure your swimmers’ shoulders are ready for the stress and don’t do too much too quickly. A set we like to use at Long Eaton Swimming Club, Derbyshire England is called “man ups”. Its a basic complex training set that hurts but is great fun. I had the swimmers pair up and put one partner in the water for VK and the other partner on deck. 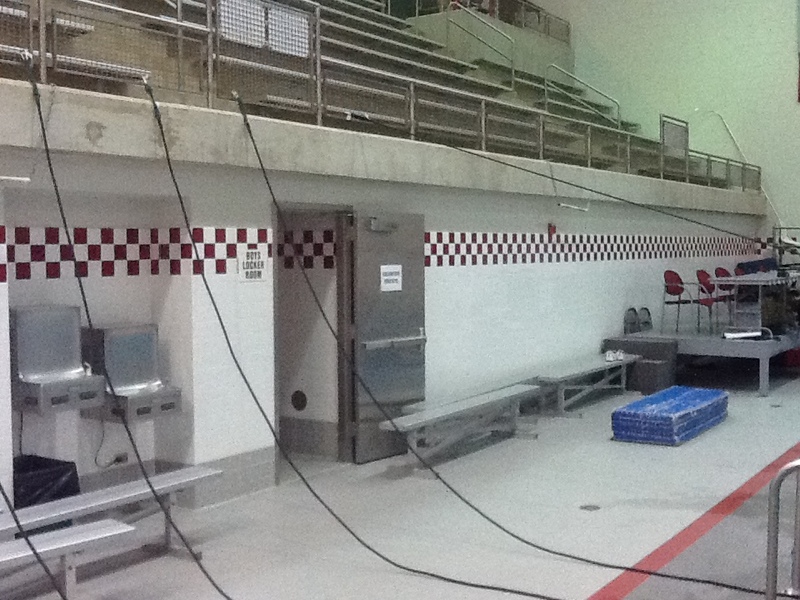 The swimmer in the water was to vertical kick breastroke right up on the wall (so their knees couldn’t come up). I had the kicker hold the med ball for 4 kicks and pass on the 5th. The partner on deck would simply drop the ball back to the swimmer. After 1 min, they switched. So actually each swimmer kicked 2 x 1 min. On the 75s, I had the swimmers think about stretching their strokes out into long streamlines, and although tired from the VK, have them think about lowering stroke count through leg-driven breaststroke and streamline. The interval gave rest to the good breaststrokers and challenged the others (but with rest). I realized that the attention to the VK and throwing the med ball might be too much for the group, I switched it up each round. I made the partner out of the water do flutter kicks on the edge of the wall while the swimmer in the water VK with med ball, etc. Pick swimmer for ‘Pressure swim’ and give him/her 10/15 minutes to prepare. Leave poolside whilst others continue with session. Bring ‘competitior’ out and get all other swimmers out of pool to support him/her. Swimmers then has to race and be within 1% of best time. If they make the time, all swimmers swim down and leave early. If the swimmer fails, they ALL do 1000m Max for time. Great for teamwork/team building. You guessed it… this one will burn! 30 x 50 done in ten sets of 3. After each set of three, perform 8 press-outs on the edge of the pool, adding :10 seconds to the interval on the 3rd 50. A little while back, we posted Part 1, a similar set. 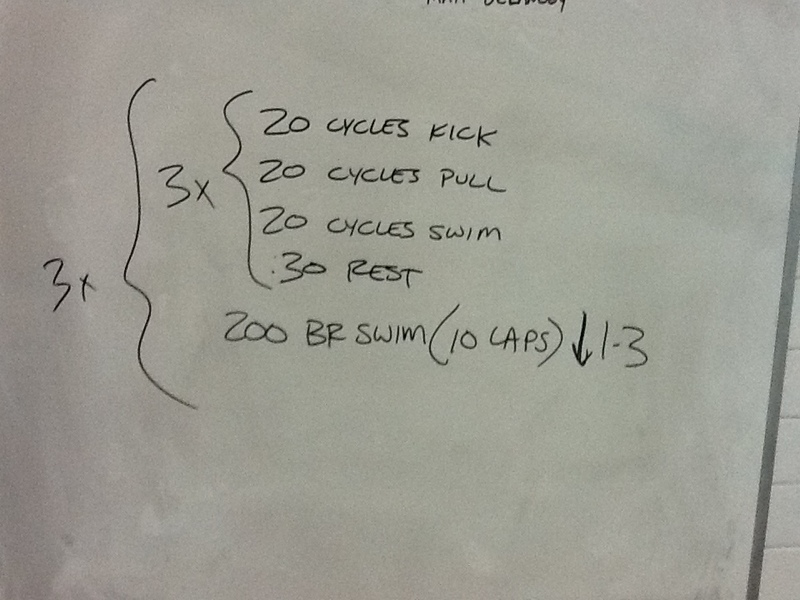 This week’s set is another step forward (more fast swimming). One of my favorite pieces of training equipment is the Power Tower. It’s a terrific tool for making your athletes stronger in the water. In order to keep our swimmers’ shoulders safe, we never load it up to see how much we can do. In order to determine proper levels of resistance for training, we gradually increase the resistance by pouring water into the bucket to find the maximum volume at which the athlete can hold a normal cycle count. Other teams put discrete amounts of weight into the buckets using water jugs, lead weights etc. We prefer to just use water and measure the amount using a yardstick. Any great Power Tower sets out there? This exercise builds off of the Teammate Drag. It is best done for a 25 at a time. Here is how it works. Swimmers are partnered, with one swimmer pulling (sprinting) and the other being pulled. Somewhere between the 15m marks, the trailing partner pulls the leading partner’s leg, attempting to slingshot to the lead. They then sprint to the wall. The kids love this exercise, and it really got them going pretty fast. We did the blastoffs (streamline push off the bottom and explosive dolphin kick to the surface) in the 7-foot shallow end of our pool. Works beautifully for 5 to 6-foot-tall senior swimmers. Have swimmers strive for 4+ dolphin kicks during each blastoff. All kick is choice without a board. Use a board on the 300.